Where to find them ? We’d like to present to you here the different stages of our work throughout the year. 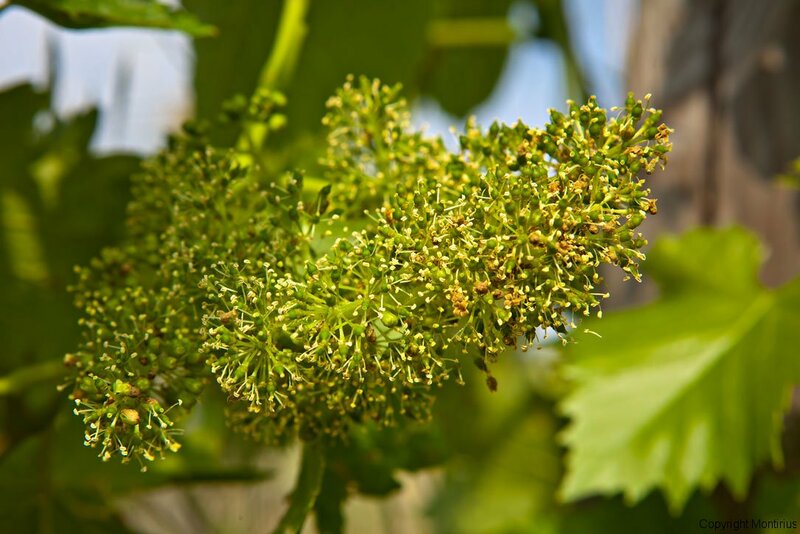 Spring, summer, autumn, winter….. nature does not wait and the attention needing to be brought to our vines and our soil is varied. A detailed review of our work throughout the seasons. 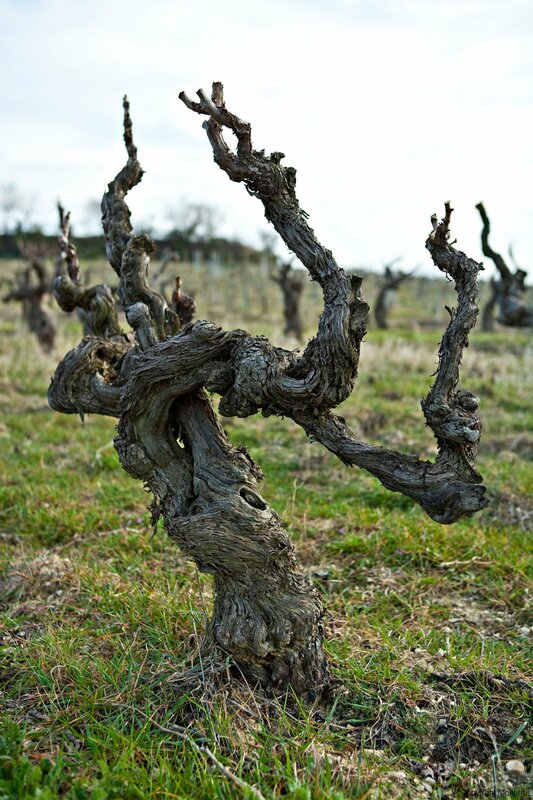 From the beginning of spring, the vines awaken from their winter sleep. This manifests itself by the rising of the sap in the vine stalks, and in the branches which were, prior to this, cut back. This is called ‘crying’ and only lasts a few days. 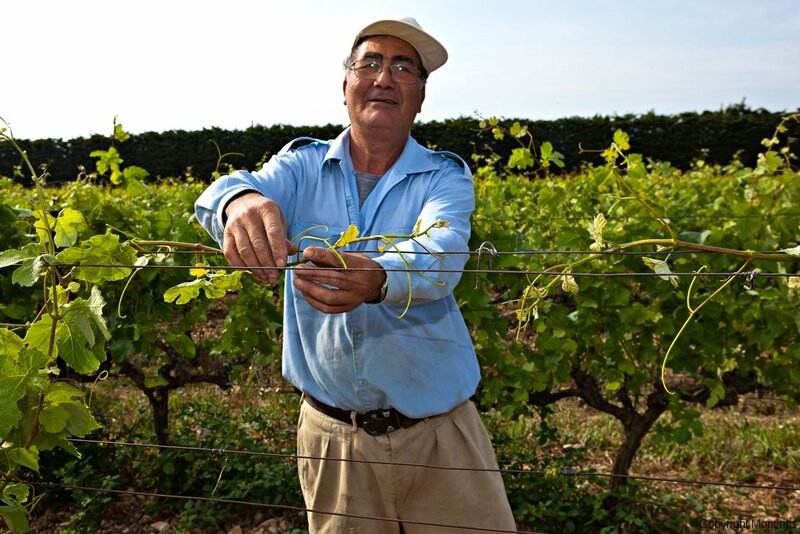 Ridging consists of making a mound around the vine stock. 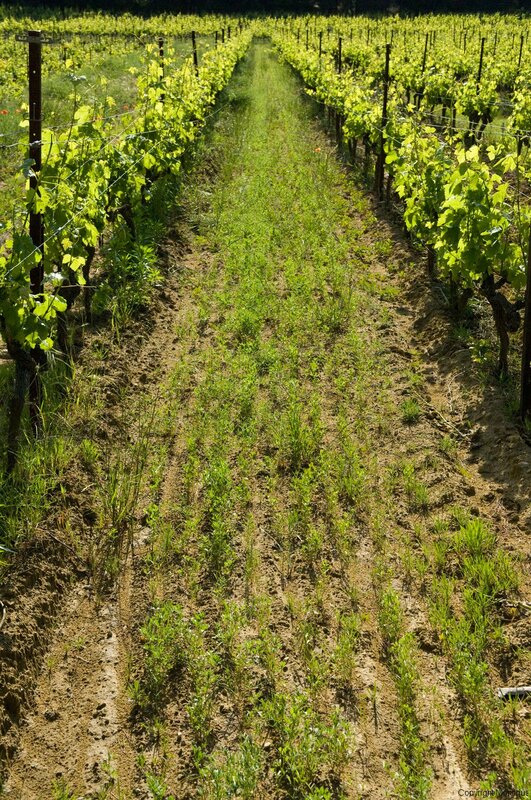 This work allows us to naturally maintain the space between two vines in the same row without grass. 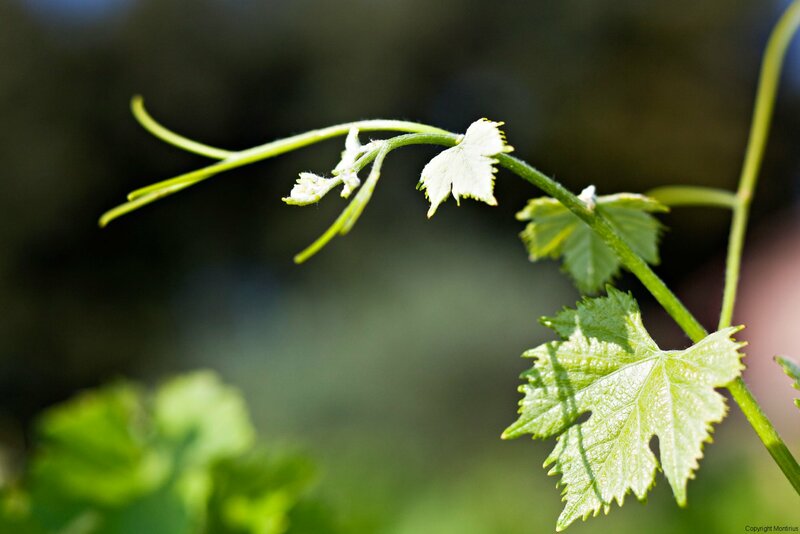 The role of the apex is very important in the vegetative cycle of the vine. 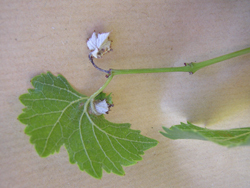 The photo seen here shows an Apex at the extremity of the branch. If the tip or the head is cut, and the sides of the branches, we cut the Apex. When the Apex is cut, secondary Apexes grow, greater in number, which disturbs the plant. The principal Apex, uncut, normally dies naturally around mid-July. 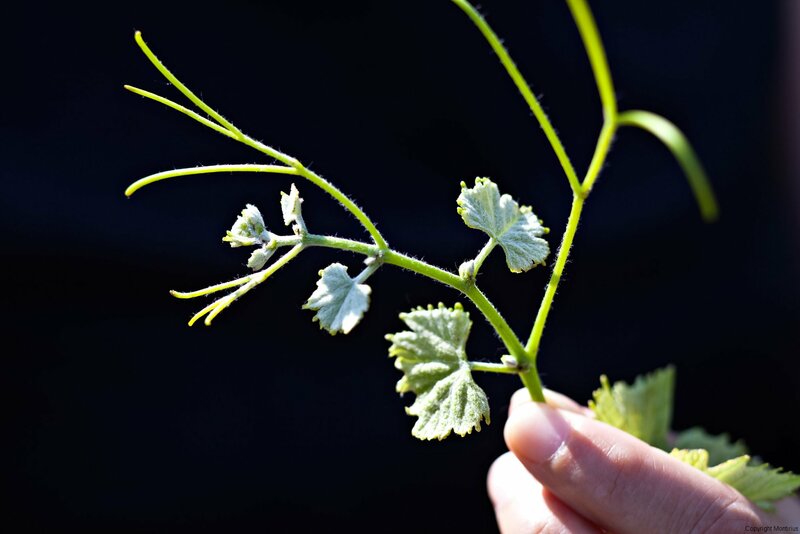 (See photo attached) This completely stops the leaf growing and promotes concentration in the grapes. 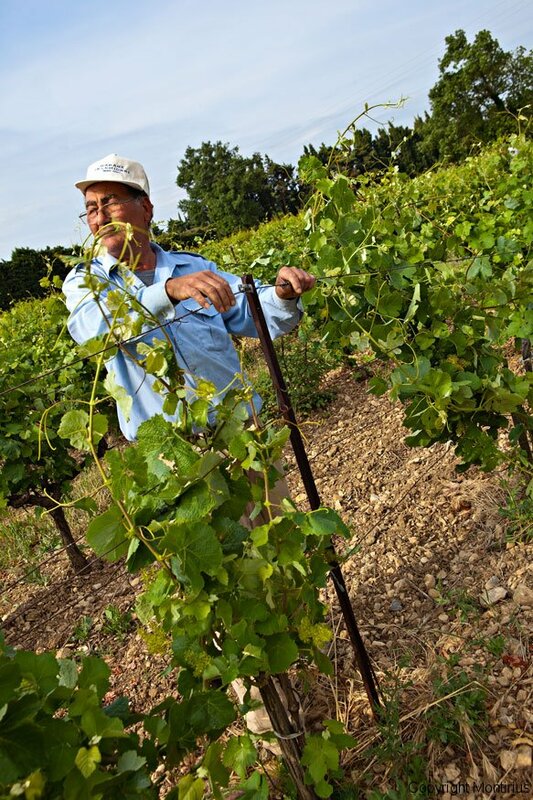 In this region, if the Apex of the ‘Mourvèdre’ vines is cut, it is certain that the grapes will not achieve full maturity. 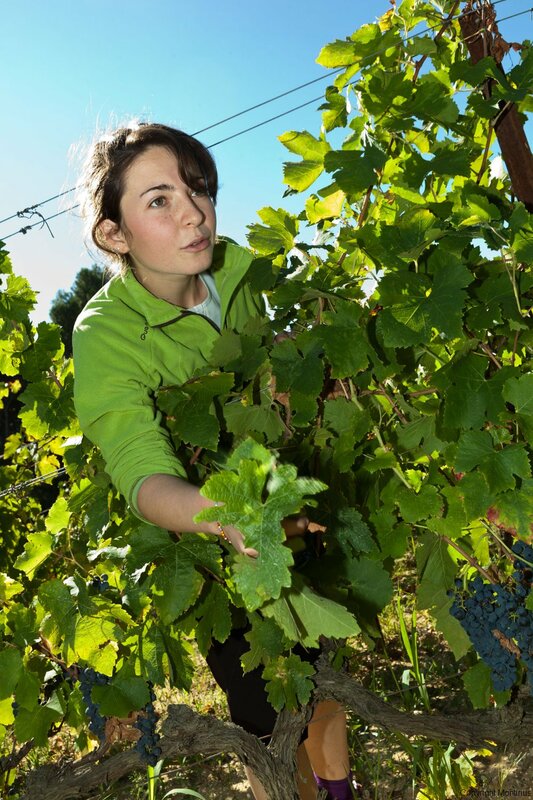 So as to preserve the Apex of each vine, we employ an extra 4 people between May and the end of July. 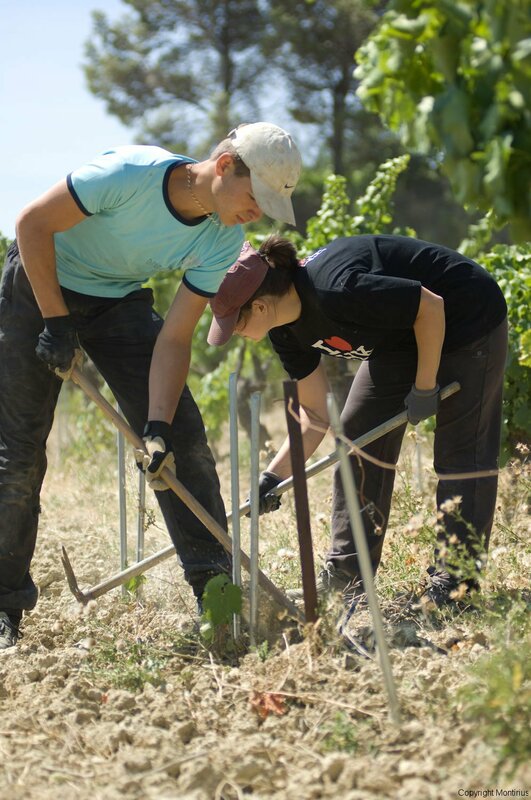 They come to give a hand to our annual team to wind the vine shoots onto the trellises on our 58 hectares. We have noticed on our domain that certain leaves take on a form which allows them to catch a maximum amount of sun. Of note in these photos is the position of the tendrils (a sort of stalk without a leaf) which are facing the sun. Of note in both photos are the obvious signs of good health in a plant. 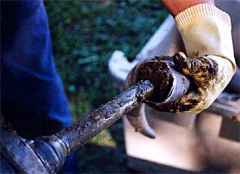 It allows us to determine if we should use the Bio-Dynamic quartz based preparation number 501. 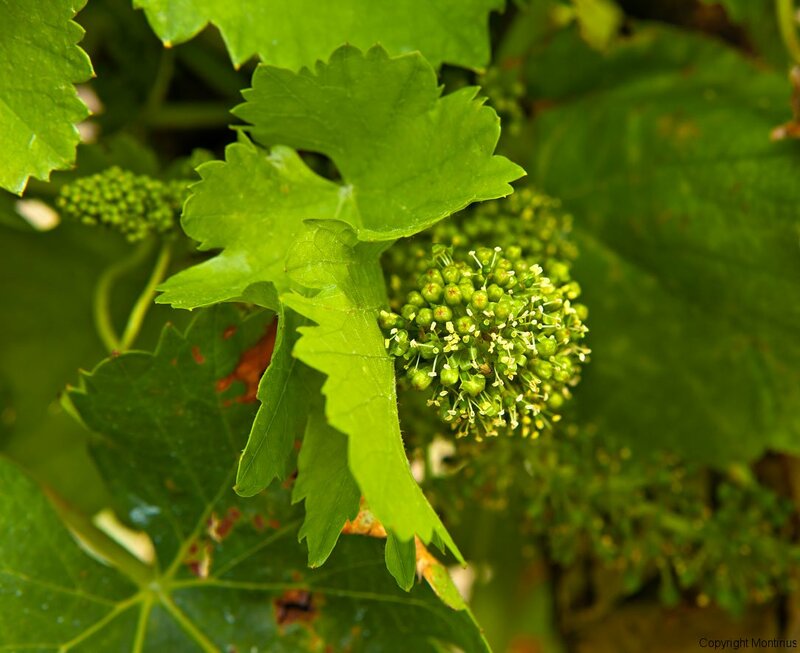 We see in these photos the birth of the grapes, the opening of the flower hoods and the emerging of stamen (little white stems). 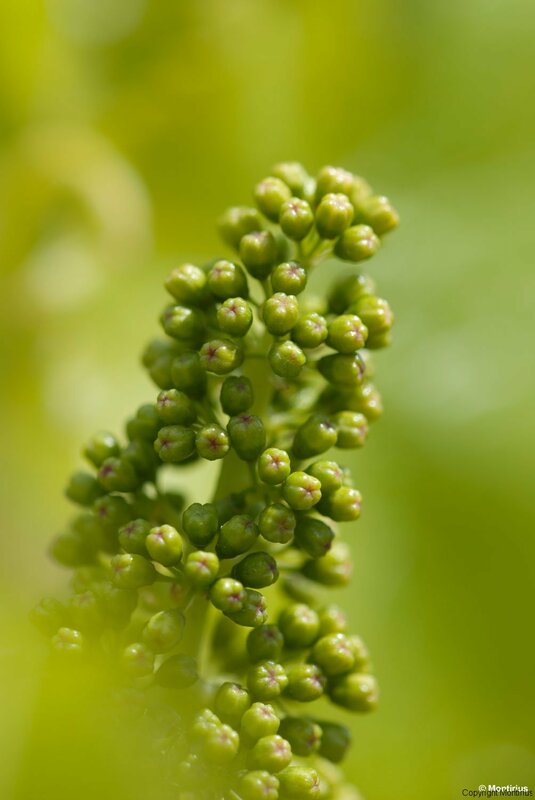 At this stage it is still too early to know if the bunch being formed will give grapes. We use cow horns filled with finely crushed quartz crystals. 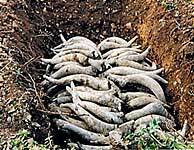 The horns are buried in the soil between May and June. We take them up before Christmas. This preparation is made on the domain every spring. 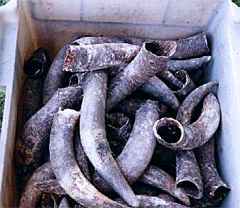 Above, the appearance of the cow horns when taken up from the soil. We know if the preparation has worked from the reddish colour seen on the horns. 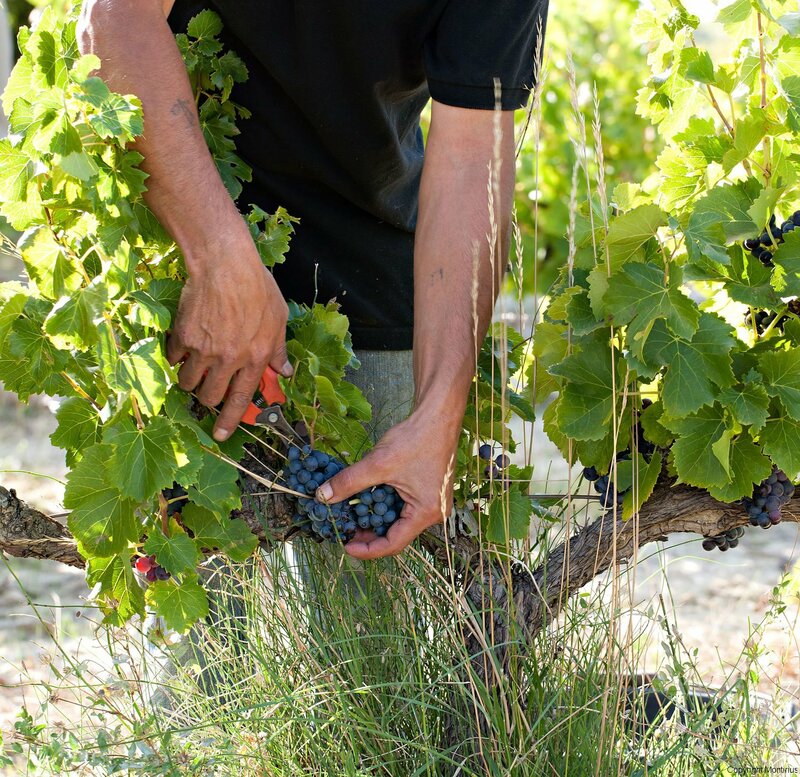 On our domain, grassing is done between every second vine row. 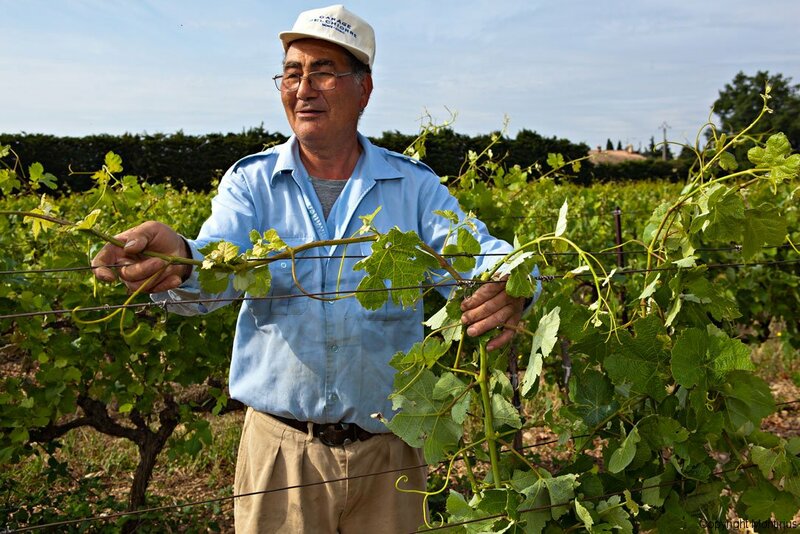 This is to protect the soil from the sun and to maintain humidity in the vine rows. It also allows us to use the tractors rapidly after a lot of rain or hailstones. (The non-grassed rows are ‘griffonnés’ or weeded all through the spring and at the beginning of summer). 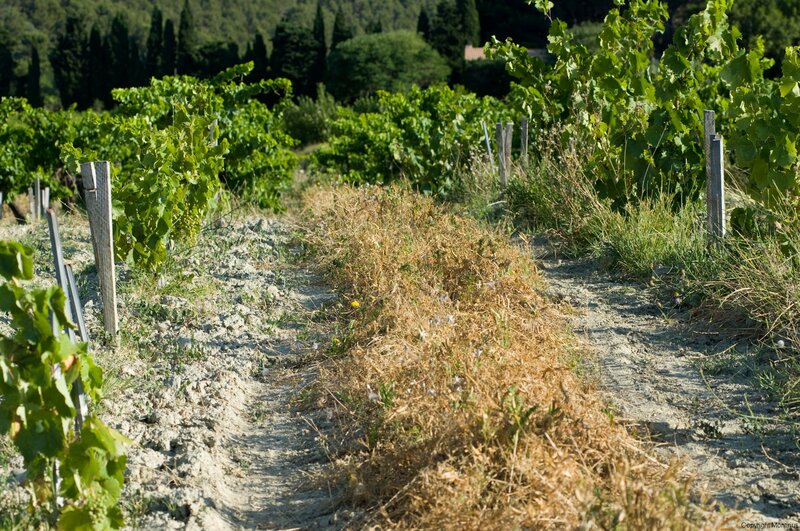 These grasses create corridors of vegetation which allow auxiliary insects to penetrate the whole parcel. In fact, a scientific study showed that auxiliary insects living mostly in the woods or in the thickets along the edge of the parcels, only penetrate the parcels for about 50 meters, unless there is vegetation such as the grassing to help them to find shelter. 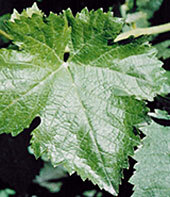 The plant used for grassing the vine rows is ‘Vesce’. 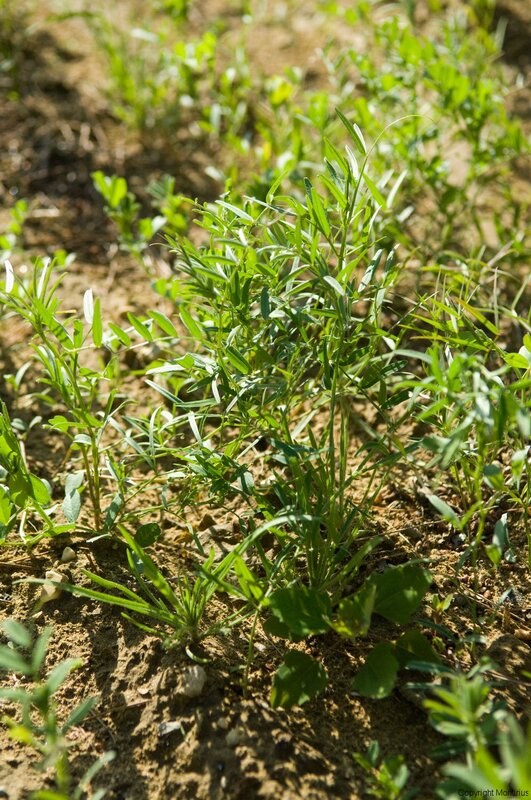 It is a leguminous plant (derivative of vegetable) which has the attribute of developing during the spring, remains all through the year, and dries up during summer weather conditions. The dried plant protects the soil from the sun’s rays, it never presents a challenge to the vines and has a good covering capacity which limits the compression of the soil due to the passage of tractors. 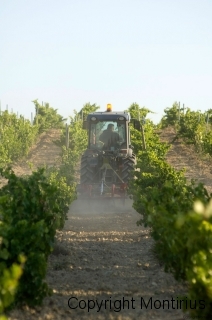 As and from mid-July, we stop working the soil of the non-grassed rows so as to avoid stimulating the vines by our weeding. 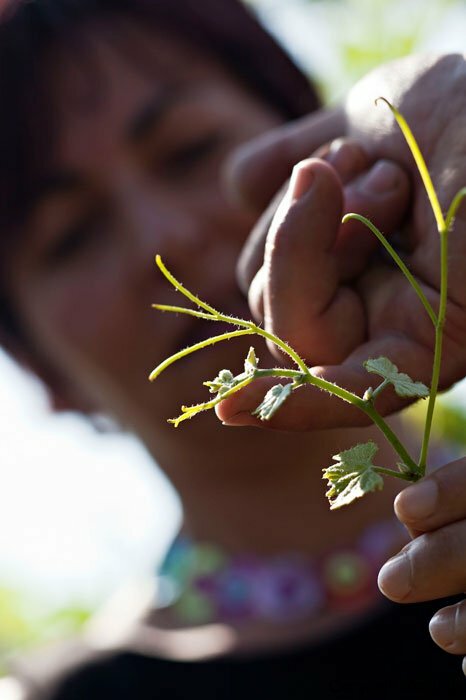 It is worth noting that weeding both gets rid of the weeds but also stimulates vine growth. 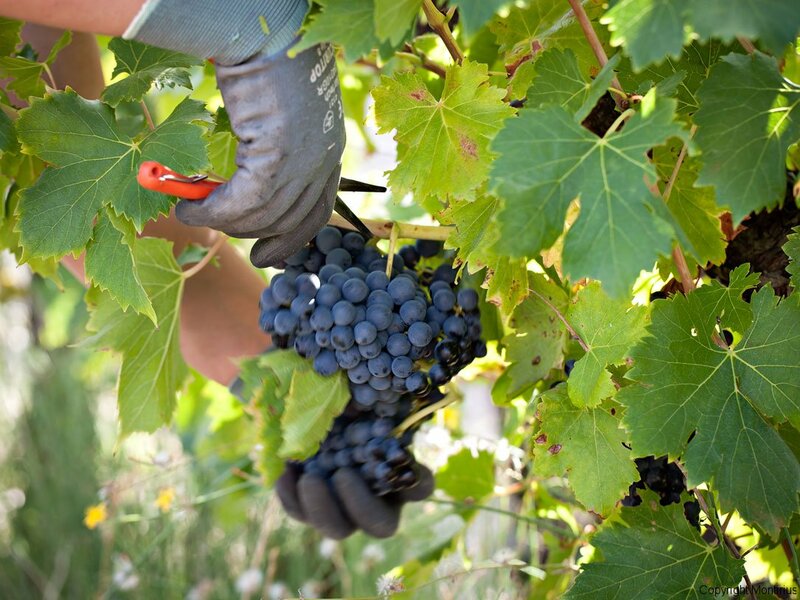 In summer, what we want from the vines is that they stop growing and use their energies to ripen the grapes. It is due to the cessation of weeding at the beginning of summer that a wild flora develops in autumn. It grows throughout the winter. 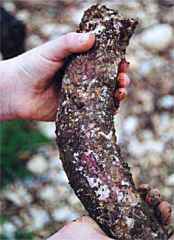 The aerated roots de-compress the soil and favour microbial life. This acts as an organic supplement when the grass is mowed in the spring. 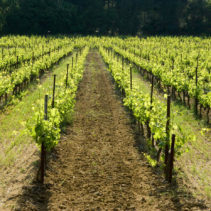 It works because the vines are at rest and the grass is not in competition with the vines. 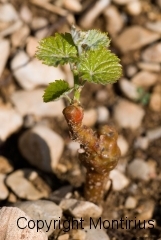 Spring is also the time to plant young vines. 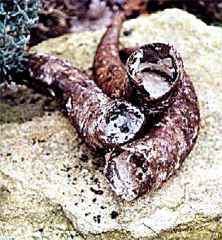 The roots of the young plants are soaked in a Bio-Dynamic preparation called preparation 500 + clay. This step helps the young plant to root. Nevertheless it is necessary to water these plants until the end of July to maximise the chances of successful planting. 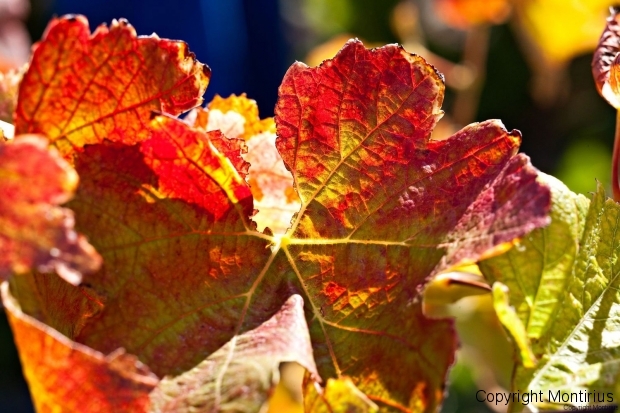 We noticed that certain vine varieties complement each other. 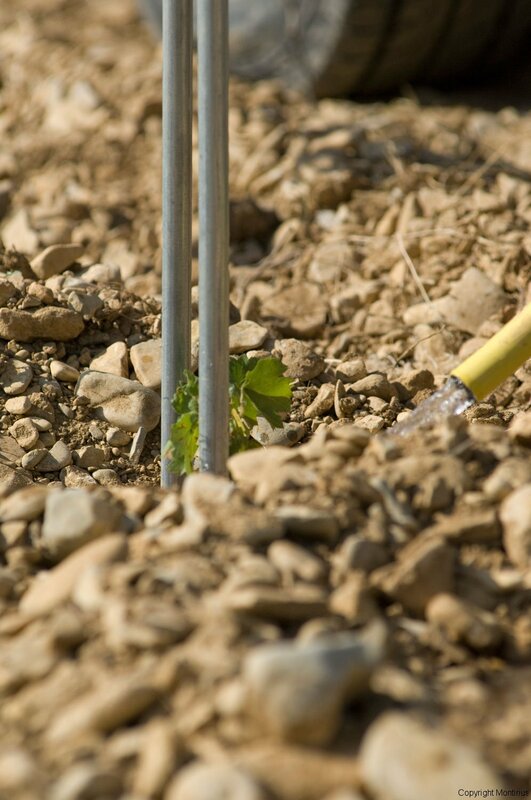 In the year 2000, we planted young vines according to this principle. 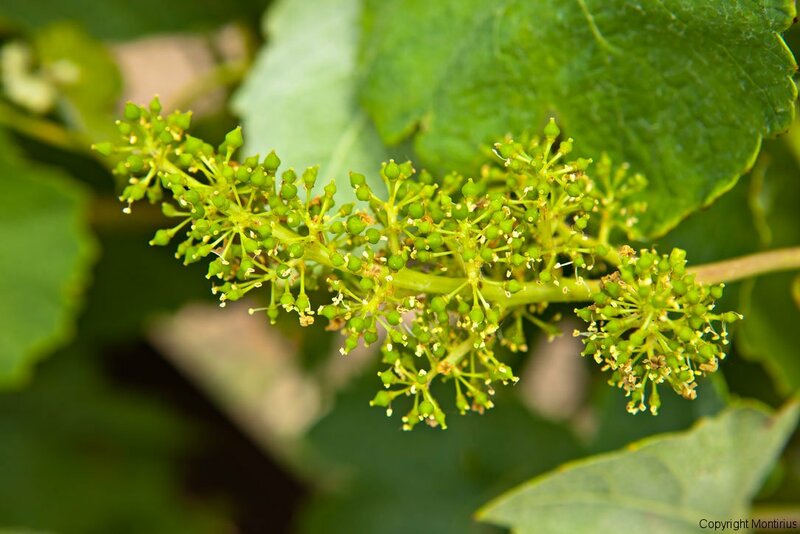 They are doing very well and we have noted better flowering and total absence of leaf disease compared to the single variety vine parcels. 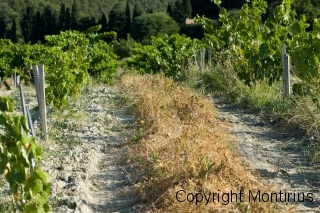 Since then, all the vines replaced in existing rows are of complementary mixed planting. For example in a row of Syrah or Mourvèdre, we integrate young plants of Grenache. 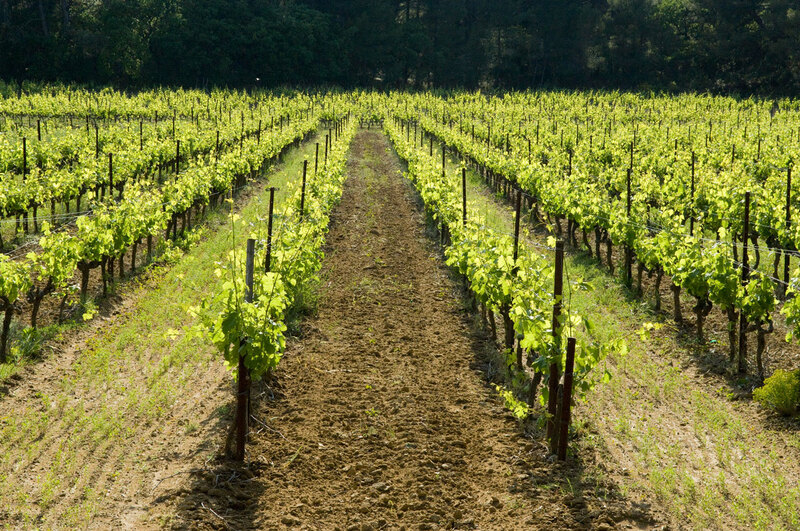 In a row of Grenache we integrate young plants of Syrah or Mourvèdre. 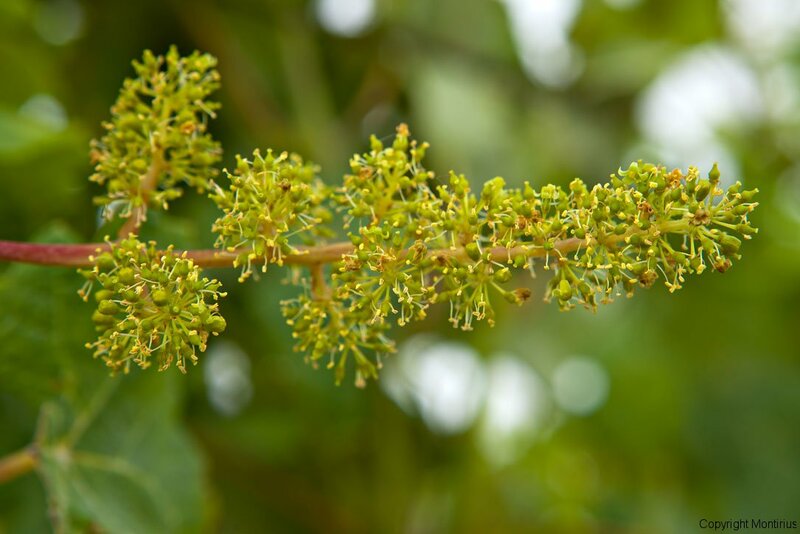 Their phenolic maturity becomes identical and we can therefore harvest and vinify them at the same time. This is a plus for the quality of wine obtained. ‘Véraison’ or ripening is the period of the month of August when the grapes start to change colour. The pips turn little by little from green to pink before becoming black. 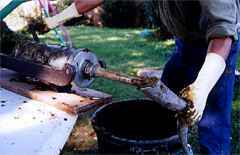 Spraying of preparation 501 just after the harvest so as to help the descent of the sap into the vine stock. 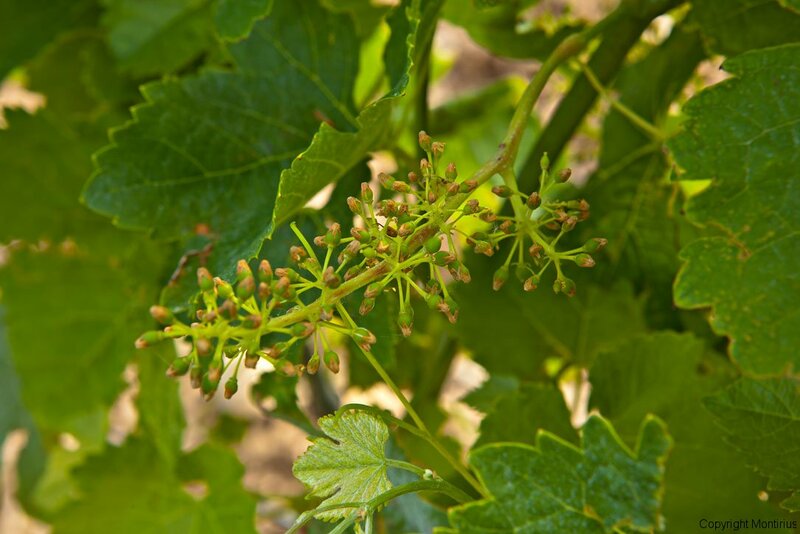 It will also give a last light pulse which will have an impact on the start of flowering for the following year’s yield. 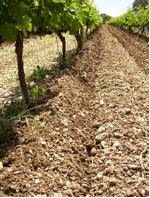 Spreading of compost in the vines. 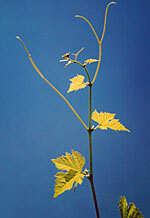 It is spread only on the weaker vines. Spraying of the Maria Thun preparation after the spreading of compost. This helps stimulate the decomposition of organic matter in the compost so as the soil can easily feed from it. 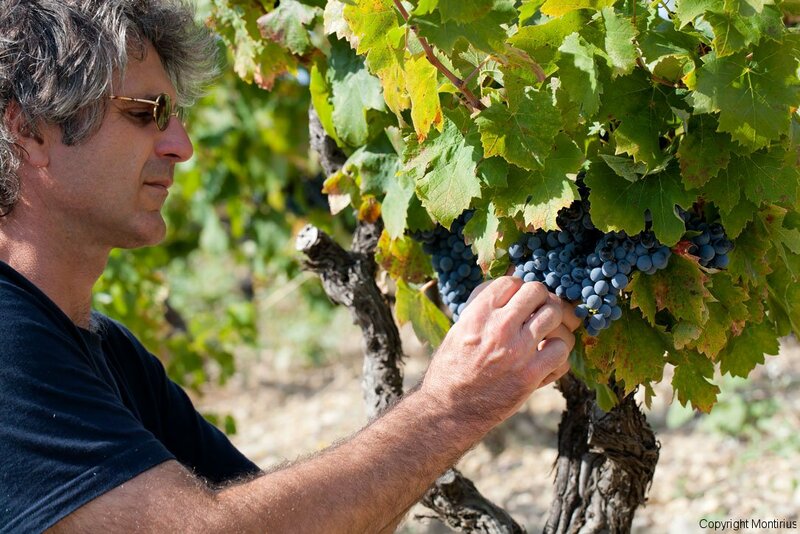 This is done during the first frosts when all the leaves have fallen from the vines. In fact it is only when all the leaves have fallen that we are sure that the plants are fully at rest and there is no more sap in the shoots. 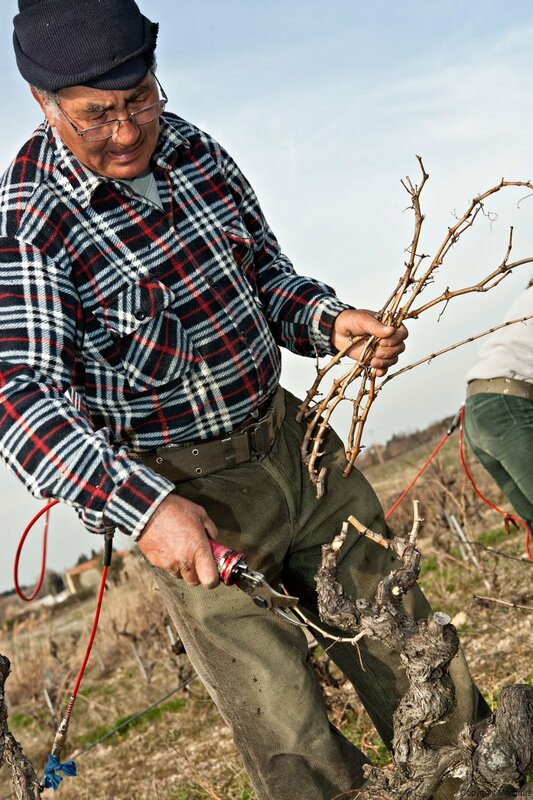 Pruning is done regarding the individual need of each vine. It is only the permanent employees on the domain who are authorised to undertake this important task for the new year. 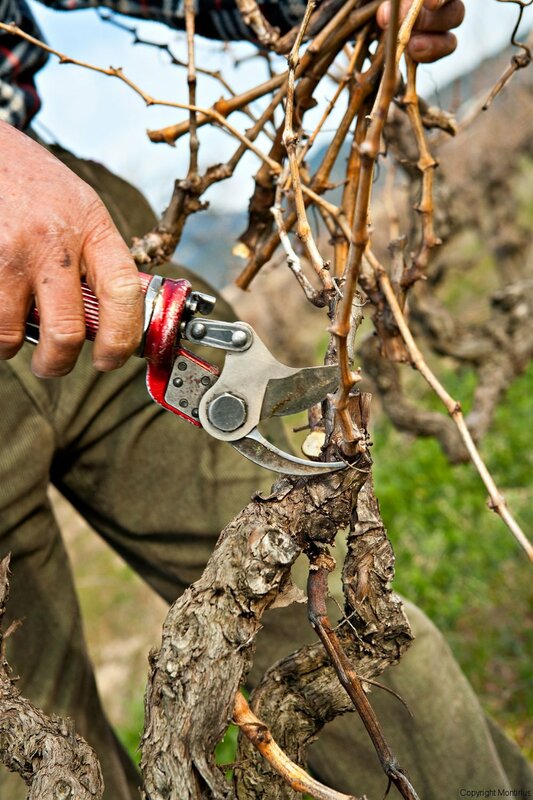 Pruning must imperatively be done by the end of March. 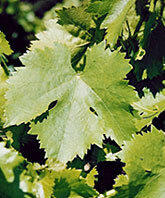 So as to heal the wounds of pruning, a Maria Thun preparation is sprayed bit by bit on all the pruned vines.